These knives are made with the same edge-holding steel as Flexcut gouges and chisels. 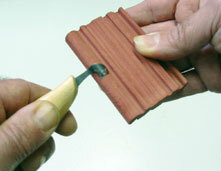 The comfortable handles allow long periods of carving without hand fatigue. Click on codes to see pictures. Knife sets are listed here, more detail here. These knives are essentially right-angled gouges designed for carving areas where the full length of a gouge will not fit. Knife carvers will find them useful for hollowing deep, narrow cavities. Right and left handed models are available. (Right-handed carvers - choose a right-handed tool to cut towards you - choose a left-handed tool to cut away from you.) Click on codes to see profiles.. The sizes we stock are listed below. Any other Flexcut products can be special-ordered, usually shipped within a week or two. Free Flexcut Catalog available, just ask. PLEASE CLICK ON CODES TO SEE PICTURES OR SWEEPS.